So I've pretty much declared myself a Unicorn now, so pretty much everything I look at is going to be through that spyglass, such as it is. With that in mind, let's scout out the Scorpion and see what tricks they can throw at us, and what we need to watch out for. This may still be useful for non-Unicorns. Bayushi Shoju is the biggest and baddest thing around, and we should all be familiar with him and his ability. Being able to gank any 2 POL character that shows up in a POL conflict with him is worrying, and gives him an effective 9 POL into any fight even if you don't send in a low POL character. You may be able to draw him out into wasting his Action on other, higher POL characters before sending your cavalry in, but he's going to be hard to deal with regardless. Note: His ability works for POL conflicts only, so you can always make him a Captive Audience. Yogo Hiroue can sneak up on you too, especially if you want to wait before committing your forces... you know, like we always do. You know how we like to throw things into our discard pile so we can fish them out later with Cavalry Reserves? 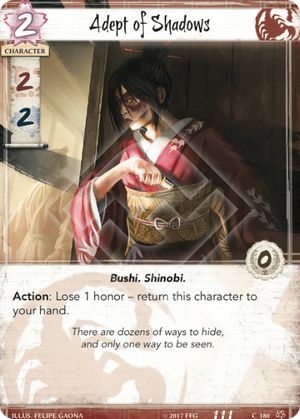 Shosuro Actress not only digs them out, but puts them to work for the enemy. Notice how some of our best characters have 3 cost? Thank goodness they can't be Seeker of Air twice in a row. 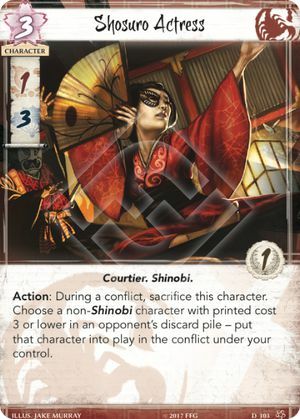 Secret Cache is really good for Scorpion not only getting card advantage but getting the RIGHT card advantage. Look at 5, pick 1 is good enough as it is, but they can do it every time you attack if you don't crack this province the first time. As Seeker of Air, you can't even consider yourself safe if you see a Fertile Field or Manicured Garden, they could still have the Cache hidden away. That being said, it is one card, and once it's face up you know where it is. Just... don't attack it again unless you have to. 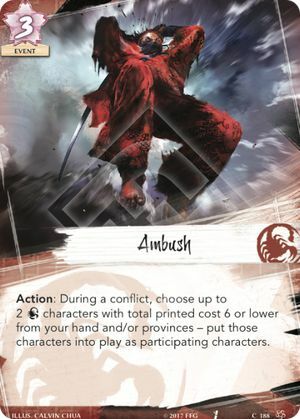 It seems like just about everyone has a 3 Cost / 3 Influence trump card, and Scorpion's is... mean but not unfair. Just keep an eye on sending too big of a 2 or 1 cost character into a fight until or unless you can get them to spend that fate. Or... you know... just be less honorable than the Scorpion. As a Unicorn, you should see this one coming a mile away. 3 Fate and some guys jump into the fight. As an added bonus, unless they are coming from the hand, you can see who is in the provinces, and thus who is able to show up. You should be ready for that to happen anyway with Charge for just 1 fate. No real way to stop this from happening though, but as Unicorn we can try and get them to toss it out before we bring our own cavalry in. There's also Unassuming Yojimbo, but that's not really all that worrying for us. 3 MIL / 1 POL and Covert means a steep price to pay for defense, and it has to come out of the hand to declare for the attack, or we've already declared defenders. Oh, and Cavalry. Could be part of the Ambush, admittedly. Not so much a surprise, as 2 MIL / 2 POL for 2 Fate isn't a very efficient surprise, but one that can just hang around no matter how many times you think you've gotten it taken care of. Oh, and it can show up for both defenses for the net price of 1 honor and 4 fate. Again, not efficient, but consistent. Watch that honor dial. Scorpion can surprise you with this guy and between that and Way of the Scorpion (or one of the other fun ways Scorpion has of dishonoring people) it can be used to drop just about anything. 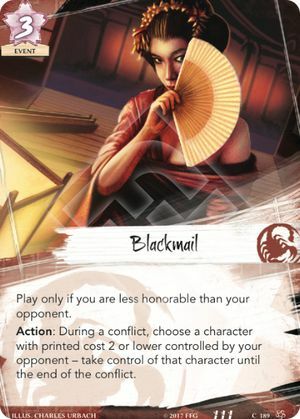 It's Scorpion's way of ensuring you can't just low bid them in an effort to starve them of cards (not that this isn't a good tactical decision). For us, the best way to deal with it is just not to overly invest in any characters. If it takes them 2 cards and at least 2 fate to get rid of a 3 fate character with 1 extra on them, it hurts but it doesn't wreck us. If they get rid of our clan champion with 2 fate onboard, it can swing the game. There are a lot of things you can do with just a single fate, and your opponent will have 1 fate so often that it doesn't make sense to worry too hard about it. 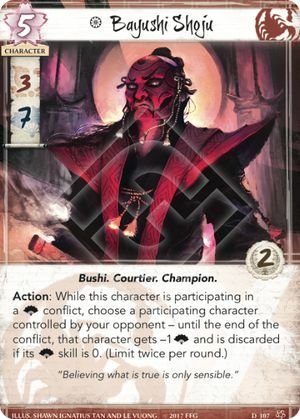 There's one card we really need to keep our eye on though (and one neutral card almost guaranteed to be hanging around). Fiery Madness and Court Mask are just 1 Fate for MIL / POL force, nothing too spectacular. They want our spyglass. They will dishonor people to take our spyglass. There is not a lot we can do about this, besides try to sucker them into using them on things that aren't spyglasses, or making them Let Go of our spyglasses by splashing Dragon. 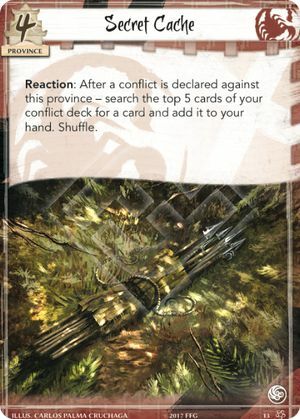 Expect to see this in a Crane deck, because they had some extra influence left. Add "and they have a courtier in play", but let's be honest, they have one out. This can trigger in any conflict, at any time. To contain it, either buff your guys prior to joining the conflict or count on moving them back in after they get bounced home. Again, this is less dangerous for us because Cavalry, but it can definitely hurt, especially if we've already used our movement abilities. If they have a non-dishonored courtier out you've got to watch out for this guy. 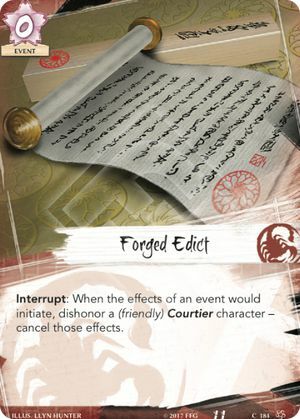 Forged Edict is one of the two big "Counterspells" for this game, with the Crane having the other one by way of "Voice of Honor". You know how all our best gimmicks are events? This is one that you really, really need to work to tease out, because they're probably going to want to save it for one of our biggest splash events. 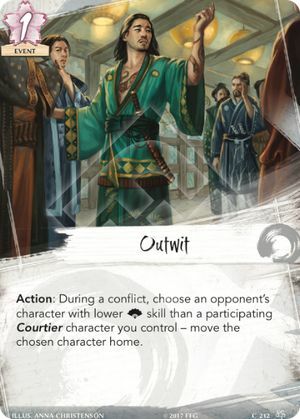 And the cost is paid before it cancels the effect, so "I am Ready" causes us to lose a fate on a character without it standing, and "Captive Audience" we lose honor before the conflict type refuses to change (imagine the courtier just running up and shouting "Emperor says no horses here!" really loudly). Oh, and 3 Fate is paid to Cavalry Reserves for no reserves actually showing up. Try to get their courtiers dishonored before doing something fancy. Court Games is a possible way to do this - instead of honoring your own guys, make them dishonor one of theirs. Try to tease it out with one of your lesser but still splashy events (I am Ready) before going for the jugular (Cavalry Reserves). 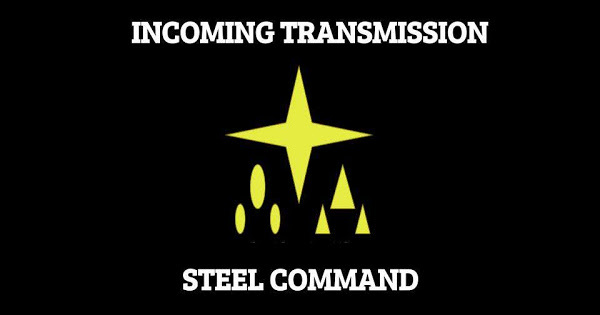 Expect to see this as part of a splash into Crane decks. 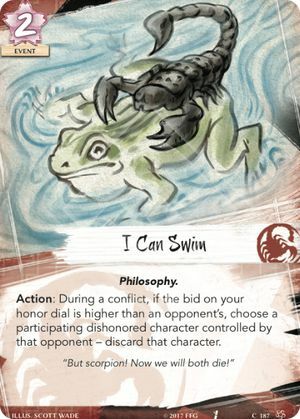 Every Scorpion deck is going to run this. So are a lot of other decks. The easiest way to deal with it is just don't toss extra fate or attachments on your 1 Fate / 2 Fate characters unless you really, really need to. 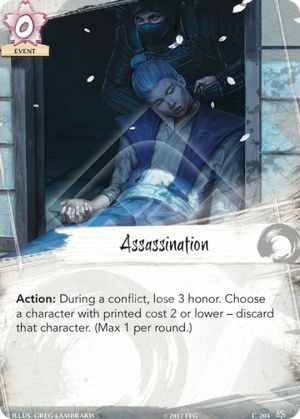 Utaku Infantry might be the exception to the rule, as 1 extra fate for a really strong, cheap card isn't going to break the bank, even if they get splatted. 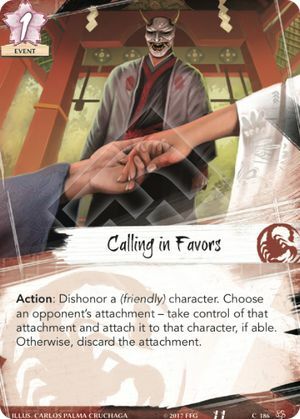 Still, if you can make them burn a card and 3 honor to get rid of a 1 Fate character, you're coming out ahead in that exchange. So, does that pretty much cover it? Any other tricks you've seen the Scorpion use that you think I should have spoken about? Leave it in the comments below!